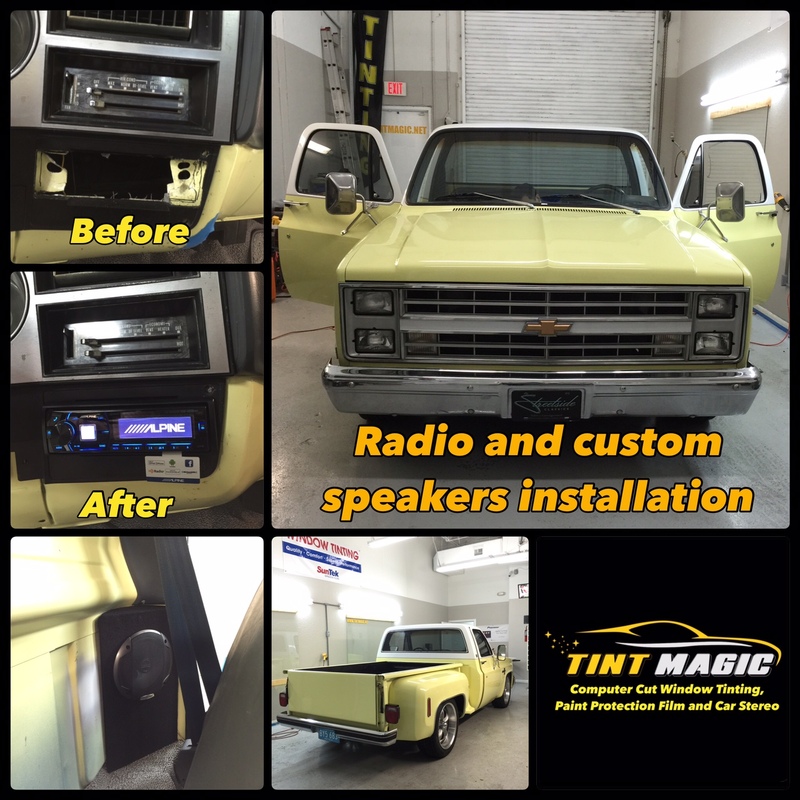 Chevrolet Silverado 1980 at Tint Magic Window Tinting. We have installed a new Alpine single din radio with bluetooth and custom speakers. Call us for a free estimate! (954) 840-7883. An all-new clean sheet redesign of General Motors’ Chevrolet and GMC brand C/K-Series pickups débuted in mid-1972 for the 1973 model year. Development of the new third-generation trucks began in 1968 with vehicle components undergoing simulated testing on computers before the first prototype pickups were even built for real world testing. The redesign was revolutionary in appearance at the time, particularly the cab, departing from typical American pickup truck designs of the era. Aside from being near twins, the Chevrolet and GMC pickups looked like nothing else on the road. The third-generation trucks are officially known as the “Rounded-Line” generation. GM’s “Rounded-Line” moniker highlighted the pickup’s rounded-lines or rounded styling cues that were incorporated into the design. These rounded-lines included rounded windshield corners, rounded cab roof, sloped rounded doors which cut high into the cab roof eliminating roof height, rounded front fenders, and rounded pickup box corners which allowed for rounded or curvedwraparound taillamps, a first for GM pickups. The design also featured strong distinctive curved shoulderlines which rounded out below the beltline. The curved shoulderline continued across the back tailgate on Chevrolet Fleetside and GMC Wideside models. A common, but incorrect, nickname for these trucks is “square body” which was propagated through truck magazines and word of mouth. As the square body name did not originate from General Motors, it is therefore not the official name for this generation. here were two types of pickup boxes to choose from. The first type, called Fleetside by Chevrolet and Wideside by GMC, was a “double-wall” constructed full width pickup box and featured a flared shoulderline to complement the cab in addition to rounded box corners and the new aforementioned rounded wraparound taillamps. Both steel and woodfloors were available. The second type, called Stepside by Chevrolet and Fenderside by GMC, was a narrow width pickup box featuring steps and exposed fenders with standalone tail lamps. Initially, only wood floors were available.